Did you know that there is a Friends organisation for the Tamar Valley? Click here for the latest news from the Friends of the Tamar Valley. 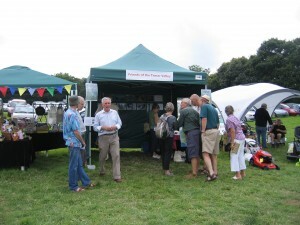 The Friends of the Tamar Valley was set up at the beginning of 2011 to support and promote the Tamar Valley in as many ways as was needed. We are a group of about 100 people with a passion for the Valley, and we would like to grow that number as we are sure there are many more people who are as passionate as we are! From September to May we have a meeting on the first Friday in the month at the Tamar Valley Centre, with various speakers either talking about the diverse aspects of the Valley, or people who live and work in the Valley and have exciting lives. Our speakers range from someone talking about Tavistock Abbey, about the areas that are managed by the Cornwall Wildlife Trust, the filming of War Horse on Dartmoor, to the connection with the Scilly Isles in times past, and to the connection between William Morris and Devon Great Consuls. During the summer months we have walks and events, and this year had a very successful and popular visit to the Plymouth Citadel as well as a guided walk in Bere Ferrers after a lovely lunch on the Tamar Belle – always a great experience! Members are always welcome to bring friends along to both meetings and events, there is a small charge for non members to join the meetings. With the opening of the new Tamar Trails Centre at Gulworthy, there is a need for volunteers to help keep the trails clear, and litter free, and of course it is so nice to see these trails walked and cycled, and to see families out enjoying them. There is also a need for help during the various exhibitions held at the Tamar Valley Centre if the indoor life is more appealing! We have an excellent Journal called The Tamar which comes out annually and contains all sorts of interesting articles on such a wide range of topics, written by a great range of people. If you are interested in joining us or have any queries, please contact me on 01822 834964. Membership forms are now available here to download!